The road tests appear to have begun. Tesla’s all-electric semi truck isn’t supposed to go into production until 2019, but multiple prototypes have already been spotted driving around California. Earlier sightings sparked predictions over where the vehicle might be traveling. And today, Elon Musk confirmed via Twitter that the Tesla Semi will be completing its first cargo trip transporting battery packs from Gigafactory 1 in Nevada to Tesla’s Fremont factory in California. This comes as no big surprise. Tesla sought government approval to test its semis in both Nevada and California. 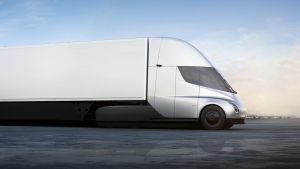 Tesla executive Jerome Guillen said that the trucks would be used to move cargo from one company site to another, according to Inverse. And Tesla CEO Elon Musk said in an earnings call last month that the company itself would be the first to utilize the autonomous semis — to carry Model 3 components from G1 to the Fremont factory. The autonomous rigs have already been spotted on the road. Driver Vlad Fed recorded his recent encounter with the semi truck in Sacramento, approximately 102.9 miles away from the Fremont facility and 157.3 miles away from G1, according to Teslarati. Considering the semi truck is said to have a range of 500 miles, it should be able to make the trip between the two destinations quite easily. In Vlad Fed’s video, the truck wasn’t carrying any cargo, which made many think this was a simple field test, or its cargo had already been unloaded elsewhere. Musk’s recently posted photo, however, includes an attached trailer — a sign that Tesla’s testing is progressing smoothly. The Tesla semis might be road testing already, but today’s announcement marks the vehicles’ first official mission. Tesla’s first customer? Tesla, of course. Musk would want to put its latest autonomous vehicles to the test before filling orders from other companies. Editor’s Note: this post has been updated to reflect new information about the semi’s deployment.